My favourite crossword blogger, Rex Parker, recently went on a rant about how crossword puzzles depicted in film and television are often completely spurious. Fictitious grids are written into scripts and rarely respect the rules of crossword or clue construction. As result, something that escapes the notice of the vast majority of observers incites disdain and outrage from the devoted few who care about such things. I find these sort of niche annoyances fascinating because they are a window onto foreign worlds of passion and knowledge. 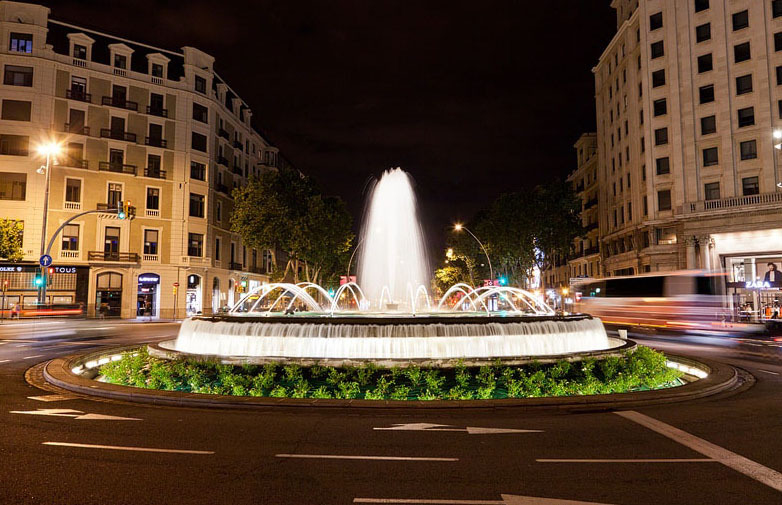 This is why I was so tickled when my friend, the water artist Pierre Luu, went on a tirade against the placement of fountains in traffic circles. Personally, I’d liked to see water spouting about as I drove past. What could be the problem? What do you think when you see a water fountain in the middle of a traffic roundabout? To be honest I don’t feel very comfortable. Although I design fountains in public spaces, it seems to me that water should not be put everywhere. In an era in which we have to minimize the use of energy, we have to make rational choices. Cars have invaded our landscapes, there are more than one billion car on the planet. If all the inhabitants of the world adopt European standards, four billion cars would be required. Should we continue to celebrate the use of cars by spending more energy, building more roads, giving them fountains, or should we face the challenge of the 21th century: learning to live in harmony with the global ecosystem that supports us? Of course water can be displayed in a spectacular way but when it really becomes interesting for me is when it reveals the inner nature of the passersby. When it invites people to play, to meditate, and to experience the moment. When people touch the water or feel its presence, the social varnish falls off and you can observe there sensuality in the way they move. What about those ubiquitous “Keep Out Of Fountain” signs? Why can’t fountains exist merely for visual pleasure? Of course they can, but is it the best way to use public funds? What are fountains supposed to celebrate? If it is just a way to say, “Hey, look how rich we are!” I’d rather leave it to those who really are. We have to organize cities that are made for people, not for a display of abundance that is not a reality anymore for those who pay attention to the scientific data regarding the state of the planet. Carefully adding a tree or some water to a place enhances the quality of life and makes the world a better place to live in. It connects us to what is essential in life. Organizing displays of grandeur is acceptable in some situations, this is also human nature I suppose, but wanting to put prestige everywhere, even on the road at the entrance of small town, is a display of ostentatiousness that is absurd nowadays. To me, visual pleasure should celebrate beauty not power. See Pierre Luu’s human-friendly fountains here. This entry was posted in KMZ Current, Knowledge, Reflections from elsewhere, Thoughts and ideas. Bookmark the permalink.